Picture - Miles Peregrine in flight with retractable undercarriage lowered. Flight- January 21, 1937. 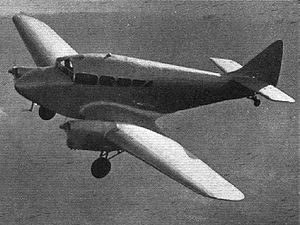 The Miles M.8 Peregrine was a 1930s British twin-engined light transport monoplane designed by Miles Aircraft Limited. The M.8 Peregrine was the first twin-engined aircraft developed by Miles Aircraft. It was a low-wing monoplane with retractable tailwheel undercarriage. Powered by two 205 hp de Havilland Gipsy Six II engines it had accommodation for two crew and six passengers. The prototype was built and first flown at Woodley on 12 September 1936. It was entered into the Schlesinger Race between England and Johannesburg but was not ready on time and had been dismantled by late 1937. The aircraft performed well but due to the Woodley factory pre-occupied with building the Miles Magister military trainer the aircraft did not enter production. One further example was built with two 290 hp (216 kW) Menasco Buccaneer B6S engines for the Royal Aircraft Establishment. One aircraft was delivered to the Royal Aircraft Establishment, as serial L6346, for boundary layer trials and use as a flying laboratory. Miles Peregrine Pictures and Miles Peregrine for Sale.